Finance Geeks are Talking Artificial Pancreas. James Cagney Wants a Cut. Then there is Medtronic's latest not-in-the-USA-yet launch. In my twisted mind, this is a significant sign of progress. AP will come incrementally. These all suggest incremental steps. Like diabetes care perfection shouldn't be the Public Enemy of the good. We met with several groups utilizing G4, CGM and developing closely* and partially close with our efficient pancreas type systems. And a significant progress has been made by many of these groups, but the pathway to commercialization for many of these projects remains unclear and we will continually evaluate our own path to the artificial pancreas closely. With our new insertion system, the G6 and other advanced sensor platforms, expanding connectivity with user-friendly apps and the ability to perform advanced analytics, one CGM and other diabetes data is in the cloud we believe we are position to lead this industry for a very, very long time. Yes, I would say our strategy is that as it relates to the artificial pancreas, we are putting together strategy so that OmniPod is a very significant part of the artificial pancreas product offering in the future. And with that you need to have a CGM product offering, as well as an offering to put the three units together if you will, and as you know we have been working internally on our own CGM development which continues but also we have an agreement with - already have an agreement with Dexcom to use their CGM sensor along with our new PDM to integrate that those two products together, and I think with that combination used in algorithm and we're looking at opportunities to have an algorithm that we could then provide the full package. I'd also say that we would evaluate and look at opportunities with Abbott and others that would have potential CGM integration opportunities for us. So in the short term we're looking at other people that have CGM capabilities and algorithm capability, but at the same time we are continuing at a low level our own efforts in our own CGM product development. Beginning in 2013 and throughout 2014, we’ve actively supported leading investigators in advancing this development of artificial pancreas solutions by providing Bluetooth enabled pump, hardware and software. We are committed to continue advancing the clinical applications of Tandem’s technology. To this effort, in 2014, we initiated the R&D concept phase of our artificial pancreas offering. Our first AP product will utilize Tandem’s proprietary technology platform and will partially automate insulin delivery based on CGM information and predictive algorithms to aid a user and maintaining their targeted blood glucose level and may reduce the frequency and severity of hyper or hypoglycemic events. In the second half of 2015, we plan to file an Investigational Device Exemption or IDE with the FDA for a clinical study in rolling our first AP product. Our discussions with FDA surrounding this IDE will help decline regulatory pathway, which we anticipate will require preliminary approval and will include data from one or more clinical studies. Dexcom - At least 5 as many as 10 product launches in 2015. Thank you, Steve. For our business update today I would like to discuss several major initiatives for 2015. Let’s start with innovation. On a worldwide basis we launched a total of five new products in 2014, compared to a total of three worldwide product launches in the previous two years combined. We are currently planning at least five more launches in 2015 and depending upon execution and regulatory time frames we can see that number go up to as many as ten product launches in 2015. Our nearest term innovation is the DexCom SHARE Receiver. Work on the receiver of this nature commenced more than two years ago, when we received the research grant from the Juvenile Diabetes Research Foundation to develop better Juveniles to support artificial pancreas research. We want to take the opportunity to recognize JDRF support of this project. This is a great example of how industry and research collaborations can greatly benefit both parties. SAN DIEGO--(BUSINESS WIRE)-- Dexcom, Inc., (NASDAQ:DXCM), the leader in continuous glucose monitoring (CGM), announced today that they are continuing their partnership with NASCAR driver Ryan Reed, the face of the American Diabetes Association's national diabetes awareness initiative, Drive to Stop Diabetes℠ presented by Lilly Diabetes. Through the collaboration, Dexcom will continue its support of Ryan Reed while reinforcing the partners' common quest of creating awareness of CGM among people with diabetes. The campaign highlights the importance of daily monitoring and tracking of glucose trends in the management of diabetes. With nearly 10 percent of the American population currently living with diabetes, education on disease management is necessary.1 The rise of continuous glucose monitoring systems, like the Dexcom G4® PLATINUM, has helped patients with both type 1 and type 2 diabetes to understand valuable information about their glucose levels and trends. #WeAreNotWaiting has become very well know in the diabetes data space. As I read about it, the next steps are slowly starting to come tantalizingly into view. Some even have hastags and Facebook pages. Others come from the usual suspects. Do It Yourself Pancreas System the fascinating collaboration of Dana Lewis & Scott Leibrand. A lovely couple if there ever was one. Their story is outlined at Median.com (1). What is clear is their DIYPS is doable. Some folks wonder why hack your diabetes? Dana's 2¢ is, "I have to make about 300 decisions per day on average. It’s really fatiguing." Brilliantly understated Dana. Having had the great pleasure of talking with them over the past year, doable was never in doubt. It was more about about when. So my big question after reading the Median piece was simply, are they moving up the wedding date? Read it and see why. Another piece that makes the connections from Nightscout to AP in Wired. (2) It goes from Nightscout to #DIYPS and then on to tease about Bigfoot. 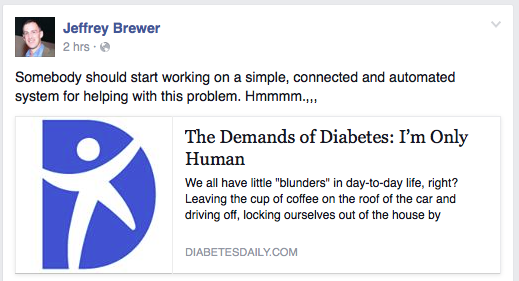 Bigfootbiomedical (3) is on Facebook where former JDRF leader Jeffrey Brewer is listed as CEO. Some other very interesting folks, who are less public about it, are said to be working there as well. I trust they will confirm those rumors in their own good time. In the meanwhile Jeffery is playing a fun game of cat and mouse with Bigfoot on his Facebook timeline today. It isn't only the home brew and startup crowd that are making strides. Medtronic has launched a next step with the MiniMed 640G (4). This new device shuts off insulin predictively. While that is an incremental step, it is a step. OK step / stride? You say potato..., it is somewhere in there. What is significant to me is progress. Medtronic will be sharing more about their next step their Hybrid Closed Loop system soon (do two steps make a stride?) It will be presented at the upcoming Advanced Technologies and Treatments for Diabetes (ATTD) 8th Annual Meeting being held at CNIT Paris La Defense from February 18-21, 2015 (5) At the last #MedtronicDAF, they said they were going to speed up bringing things to market. Seems they are. All these are great news IMHO. Before somebody starts complaining about FDA, lets remember FDA approved the Medtronic 530G under their Artificial Pancreas guidance. Lots of folks complained that it wasn't an AP. OK you AP may vary - but FDA approved it as AP and that tells me they are looking to do just that. Well, OK. Also FDA flat to say they are looking to approve innovations under AP guidance. It may be a tad short of them saying, "Bring it on!" - So maybe the 530G is, as the saying goes, proof in the pudding. I believe that better is better and perfect should not be the enemy of good. So I am all for advances in type 1 diabetes care that may fit into individual's life styles in a Your Diabetes May Vary kind of way. AP may work for some while GRI works better for others. I am fairly sure none of it will make diabetes care easy but it may be less hard and that's better. 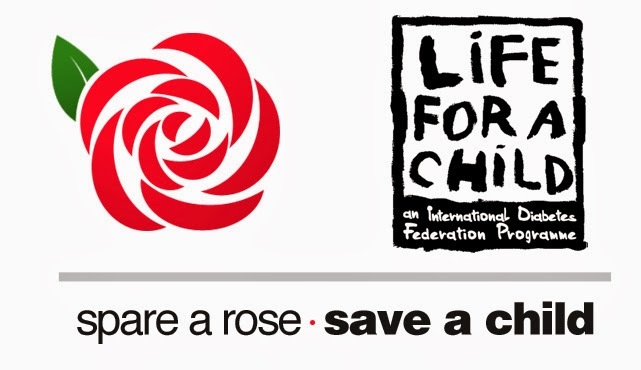 I support a diversified approach to making life better. There is a fable about putting eggs in more than one basket that explains modern portfolio theory better than most finance professors. YDMV, so should your AP options. Investigators with the National Institutes of Health have discovered the genomic switches of a blood cell key to regulating the human immune system. The findings, published in Nature today, open the door to new research and development in drugs and personalized medicine to help those with autoimmune disorders such as inflammatory bowel disease or rheumatoid arthritis. Scanning electron micrograph of a human T lymphocyte (also called a T cell) from the immune system of a healthy donor. Source: National Institute of Allergy and Infectious Diseases (NIAID). The senior author of the paper, John J. O’Shea, M.D., is the scientific director at NIH’s National Institute of Arthritis and Musculoskeletal and Skin Diseases. The lead author, Golnaz Vahedi, Ph.D., is a postdoctoral fellow in Dr. O’Shea’s lab in the Molecular Immunology and Inflammation Branch. The study was performed in collaboration with investigators led by NIH Director, Francis S. Collins, M.D., Ph.D., in the Medical Genomics and Metabolic Genetics Branch at the National Human Genome Research Institute. Autoimmune diseases occur when the immune system mistakenly attacks its own cells, causing inflammation. Different tissues are affected in different diseases, for example, the joints become swollen and inflamed in rheumatoid arthritis, and the brain and spinal cord are damaged in multiple sclerosis. The causes of these diseases are not well understood, but scientists believe that they have a genetic component because they often run in families. Identifying autoimmune disease susceptibility genes can be a challenge because in most cases a complex mix of genetic and environmental factors is involved. Genetic studies have shown that people with autoimmune diseases possess unique genetic variants, but most of the alterations are found in regions of the DNA that do not carry genes. Scientists have suspected that the variants are in DNA elements called enhancers, which act like switches to control gene activities. The U.S. Food and Drug Administration expanded the approved use for Lucentis (ranibizumab injection) 0.3 mg to treat diabetic retinopathy (DR) in patients with diabetic macular edema (DME). Diabetic retinopathy is the most common diabetic eye disease and is a leading cause of blindness in adults in the United States. According to the Centers for Disease Control and Prevention, diabetes (type 1 and type 2) affects more than 29 million people in the United States and is the leading cause of new blindness among people ages 20 to 74 years. In 2008, 33 percent of adults with diabetes aged 40 years or older had some form of DR. In some cases of DR with DME, abnormal new blood vessels grow on the surface of the retina. Severe vision loss or blindness can occur if the new blood vessels break. Lucentis is administered by a physician as an injection into the eye once a month. It is intended to be used along with appropriate interventions to control blood sugar, blood pressure and cholesterol. The drug’s safety and efficacy to treat DR with DME were established in two clinical studies involving 759 participants who were treated and followed for three years. In the two studies, participants being treated with Lucentis showed significant improvement in the severity of their DR at two years compared to patients who did not receive an injection. The most common side effects include bleeding of the conjunctiva, the tissue that lines the inside of the eyelids and covers the white part of the eye; eye pain; floaters; and increased pressure inside the eye (intraocular pressure). Serious side effects include infection within the eyeball (endophthalmitis) and retinal detachments. The FDA granted Lucentis for DR with DME breakthrough therapy designation. The FDA can designate a drug a breakthrough therapy at the request of the sponsor if preliminary clinical evidence indicates the drug may demonstrate a substantial improvement over available therapies for patients with serious or life-threatening conditions. The FDA also reviewed the new use for Lucentis under the agency’s priority review program, which provides for an expedited review of drugs that demonstrate the potential to be a significant improvement in safety or effectiveness in the treatment of a serious condition. The FDA previously had approved Lucentis to treat DME and macular edema secondary to retinal vein occlusions, both of which cause fluid to leak into the macula resulting in blurred vision. Lucentis also is approved to treat wet (neovascular) age-related macular degeneration (AMD), a condition in which abnormal blood vessels grow and leak fluid into the macula. Lucentis is marketed by South San Francisco, California-based Genentech, a subsidiary of Roche. For Most, A Need for More than Advice to Eat Right and Exercise? A recent http://www.healio.com post has the headline, "Diet, exercise alone not sufficient obesity treatment for most." It is also a signal that stigma and its partner the blame game is not a shortcoming of character. Wouldn't it be great if there was a craving for thoughtfulness as part of the public discution obesity? 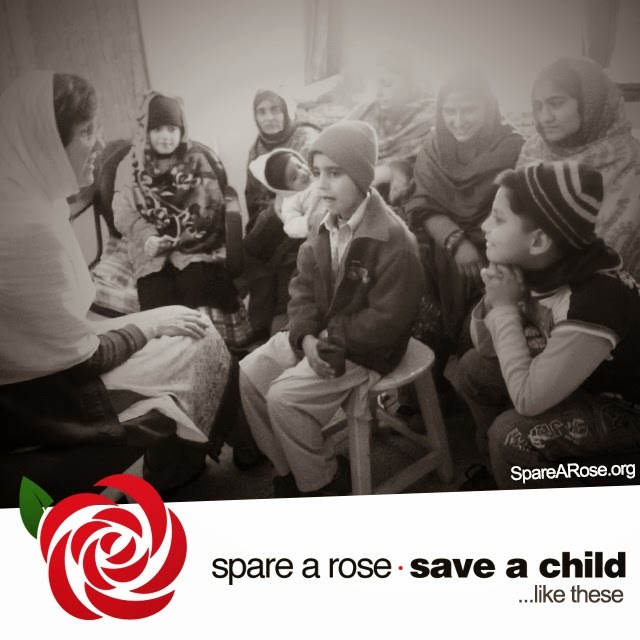 Last year most of the Spare a Rose gifts came February 13 and 14. 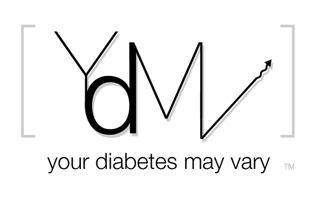 Early detection of T1D is a topic in the DOC. It is in the News too. NEW YORK, Feb. 12, 2015 /PRNewswire-USNewswire/ -- JDRF, the leading research and advocacy organization funding type 1 diabetes (T1D) research, announced today its alignment with an innovative scientific approach of Janssen Research & Development, LLC (Janssen) and the company's Disease Interception Accelerator (DIA) group, which will focus on transforming type 1 diabetes through its disease interception strategy. JDRF will work with Janssen scientists to further identify the root cause(s) of T1D with the aim of intercepting and eliminating the disease before clinical symptoms emerge, effectively seeking to create a new paradigm in health care for T1D. "Through recent research discoveries, we now have the ability to better define the early stages of type 1 diabetes before the onset of clinical symptoms and the need for insulin injections. This allows us to identify individuals in whom the type 1 diabetes disease process has started and to develop therapies to intercept it in order to maintain insulin independence," said Richard Insel, M.D., JDRF's chief scientific officer. "JDRF has long believed in preventive interventions and we are eager to support the Janssen DIA group in advancing this exciting science initiative in combatting type 1 diabetes." Diagnosing a person with T1D during the early asymptomatic stages of the disease has a host of research, development, and regulatory implications, and impacts awareness of the disease as T1D often begins long before the onset of clinical symptoms with gradual loss of insulin-producing cells of the pancreas. A successful disease interception approach may provide a window of opportunity to delay or stop progression and delay or prevent insulin dependence, thereby making a significant impact in the lives of individuals and the type 1 diabetes community. The incidence of T1D has been increasing globally over the past four decades, growing by three to four percent annually. In addition, it has been increasingly occurring in individuals that previously have been considered to have a lower genetic risk of susceptibility for T1D, suggesting a lower threshold for developing the disease and important environmental contributions to developing the disease. Today, heath care costs of type 1 diabetes total approximately $15 billion each year in the United States. The resulting increase in the prevalence of T1D will clearly have substantial implications on the health care system, both in terms of increased resources and cost. These issues are some of the drivers to address T1D at its earliest stages.